This entry was posted in Activism, Feminism and tagged privilege, race, trayvon martin. Bookmark the permalink. As parents, there is perhaps nothing quite as disturbing as hearing news about the death of a young person. We all ‘go there.’ We all imagine what it must feel like to lose one of our own sweet babies. Following the much contested and protested ‘not guilty’ verdict served to George Zimmerman this week, global optics has refocused on the death of 17 year old Trayvon Martin. As white mothers, we cannot simply say that we are color-blind in our approaches to addressing issues around race, cultural difference and privilege with our children (and with each other and ourselves). We can’t. Not only because it comes across as subtle racism to many, many people, but also because taking the ‘color-blind’ approach is not helping our children navigate this world where race-based/cultural-based crimes, laws and behaviors impact the lives of millions of people of color. We need our children to have an authentic understanding of the differences that exist between their white contemporary experiences and history, and the oft-times opposing experiences of people of colour. As authentic parents, who have the hopes of raising children who internalize and act on the genuine and everyday practices of the adults around them, these conversations need to be happening all of the time. It isn’t for people of color to educate us. It isn’t. We have to seek out the resources, the tools, the books, the articles, the blogs, the images, the leaders. It is our job as parents to share these resources with our children, and make them an authentic part of their worldview, allowing our children to acknowledge their privilege, and work against the negative impact that this privilege potentially has on other people. 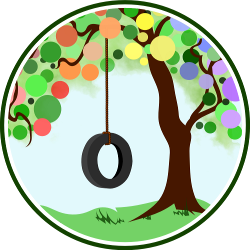 Natural Parents Network wants to help. We want to offer a collection of voices that will hopefully illuminate some of the many issues that stem from the realities of white privilege and race-relations. We want to move towards caring more effectively for each other as global citizens. 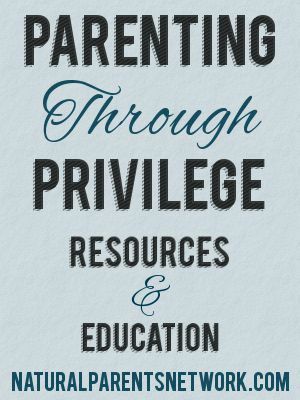 Privilege exists in parenting, as much as it does in the larger world context. Privilege exists whether you acknowledge your benefit from it or not. For example, as a white natural parent, it is very likely that you will be able to easily access a gynecologist or midwife that is white and speaks the same language as you. Again, although this isn’t something that you are actively doing, it greatly impacts the birth experience you have. Want to know more about privilege? Through the lens of accessing emergency services, Do Not Faint defines White Privilege. The essential primer on white privilege: Peggy McIntosh’s Unpacking The Invisible Knapsack. In the context of “not seeing race” From Playgrounds to Politics talks about privilege. If you want to engage in this conversation with other parents and educators, why not check out the 2014 White Privilege Conference? Watch Justin Ford talk about teaching privilege in this TedTalk. Also, specific to the killing of Trayvon Martin, I highly recommend the We Are Not Trayvon Martin tumblr. The images and words do justice to the privilege Trayvon did not have the evening he was killed. Do you need some support around being an ally? Here is a great list from The Angry Black Woman on how to be a better ally. Specific to parenting, Love Isn’t Enough, looks at how to be a better ally to people of colour. This post explores the negative, and unhelpful reactions some white people exhibit in response to discussing topics around race and the impacts of their own behaviors/actions. Want to find books to help ensure that people of color are a consistent and authentic component in your child’s reading experience? Black Child Books offers a comprehensive list of titles spanning a range of developmental stages. Of course our desire to build a more connected and compassionate society should not exist in a vacuum. Nor should our desire to parent global citizens diminish as newspapers and social media carry less and less information about Trayvon Martin. Raising the bar on our own capabilities to be better parents shouldn’t be a one off. However, given the context through which this particular conversation began, it is important to look specifically at the voices of mothers of color. It is through reading the articles highlighted below that one better understands the implicit and explicit meanings behind privilege. As a mother of three children of color, Darcel, of The Mahogany Way, writes passionately about how racism impacts her life and the lives of her children. Liz from Los Angelista poignantly speaks to the fear she has for her sons. A poem from Audre Lorde – a black, feminist, lesbian mother who continues to inspire dialogue and discussion around the issue of mothering as a woman of color. Here is a selection of Twitter responses collated from Essence magazine. Again, a stark look at how different the experience is for mothers who have children of color. Another collection of voices, entitled Born Black in America, put together by Mahogany Motherhood, looks specifically at mothering black children in a world where Trayvon Martin was killed. Incredibly powerful. We are not perfect in our parenting, and we should never expect ourselves to be. In the same way that we watch our children grow and develop, we can nurture growth and change within ourselves. Committing to a better understanding of privilege and listening more actively to the voices in the margin, we are helping to nourish the seeds of a better world. Please share your own links, resources and ideas in the comments below. Thank you for these resources! Educating ourselves is imperative to educating our children.